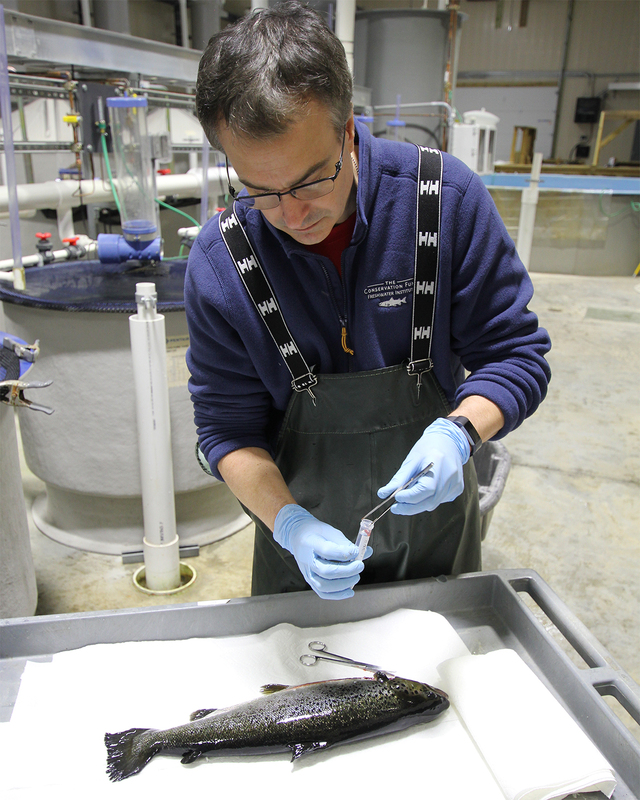 Chris Good collecting salmon tissues for analysis at The Conservation Fund Freshwater Institute in Shepherdstown, West Virginia, USA. Photo: Kata Sharrer/The Conservation Fund. Chris Good has seen US land-based salmon farming begin to take off during the four years since CtrlAQUA began, with massive facilities being built or in the planning stage. Dr. Good is Director of Research at The Conservation Fund’s Freshwater Institute in West Virginia, USA. The Freshwater Institute is international partner of CtrlAQUA along with the University of Gothenburg in Sweden, and is a pioneer in recirculating aquaculture systems (RAS) research in North America. The collaboration Dr. Good and his colleagues have with CtrlAQUA partners has been focused on experiments regarding photoperiod, water ozonation, and RAS disinfection, as well as RAS culture tank design and hydrodynamics. “I expect after CtrlAQUA finishes in 2023 the links with our partners in the center will remain strong. We all have the same interests and research goals, and it’s mutually beneficial to combine expertise to solve problems in an important and growing industry like RAS aquaculture. We definitely learn a lot from each other”, says Dr. Good. Industry growing in the U.S. In Norway, fish farmers are weighing the benefits of raising fish in net pens against land-based farming. However, by growing salmon in the U.S., there’s an environmental and economic benefit of cutting air freight. That makes the Americans, and the Norwegians who see the opportunity across the Atlantic, eager to farm more. Dr. Good believes that CtrlAQUA will have an enormous impact in the long term. With such a strong industry representation within CtrlAQUA, companies such as Mowi (former Marine Harvest), Grieg Seafood and Krüger Kaldnes can take back information from CtrlAQUA and apply it to their own objectives. Additionally, scientific publications from CtrlAQUA research will come out in an increasing pace for everybody to learn from.